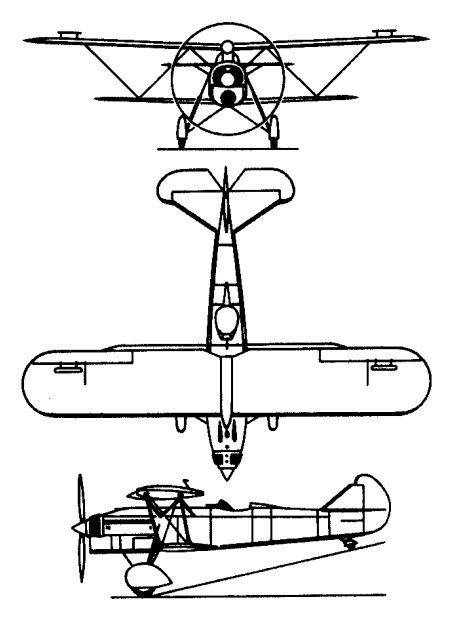 Italy’s most important fighter of the late 1930s, the CR32 biplane was first flown in August 1933 as a development of the CR30 using the same type of metal/fabric-covered all-metal structure and Warren-type interplane bracing but with smaller overall dimensions plus improved performance and agility. The initial CR.32 delivered in 1935 had the 447-kW (600-hp) Fiat A.30 RAbis engine and two 7.7-mm (0.303-in) machine-guns, and these 350 aircraft were followed by 283 examples of the CR.32bis close-support version. Next came 150 examples of an improved CR32, the CR.32ter with revised landing gear and improved equipment, and the final aircraft here 337 CR.32quater fighters essentially similar to the CR.32ter but with a lightened structure and updated equipment. The CR.32 was numerically and operationally the most important fighter fielded by the Nationalists and their Italian allies in the Spanish Civil War, and the first 12 examples reached Nationalist units in Morocco as early as August 1936. A total of 377 of this type were sent to Spain, where they equipped the Nationalists’ 2-G-3 and 3-G-3 fighter units as well as five Italian gruppi. The CR.32 was faster in level flight and in the dive than the 1-15, and was also better armed when there arrived the CR.32bis and CR.32ter with heavier machine-guns; and by comparison with the -16 the CR.32 was more agile and more heavily armed. By a judicious use of tactics, therefore, Nationalist and Italian pilots were generally able to prevail over the Republican fighters. It was used in the early months of World War II in Greece and East Africa. Hispano Aviacion SA manufactured the Fiat CR. 32quater biplane fighter as the HA-132-1 Chirri between 1938- 1942. Engine: l x Fiat A.30 RAbis, 447 kW (600 hp). Normal T/O weight: 1975 kg (14,350 lb). Max speed: 224 mph at 9,845 ft.
Engine: l x Fiat A.30 RA bis, 447kW (600 hp). Length: 7.45m (24ft 5.25 in). Max T/O weight: 1915kg (4,222 lb). Max speed: 220 mph at 19,685 ft.